A protege of John Flaxman, John Gibson gravitated to Rome in 1818, becoming a pupil of the grandest of all neoclassical sculptors, Antonio Canova. Gibson's style was determined by his admiration for, and emulation of, the prototypical masterpieces of Greek and Roman statuary. A resulting academic quality, perfectly in accord with contemporary expectations of taste, became his sculptural signature. Though he experimented on occasion with polychromatic techniques and unusual materials, Gibson's preferred medium was marble, with its traditional associations of purity and chasteness. 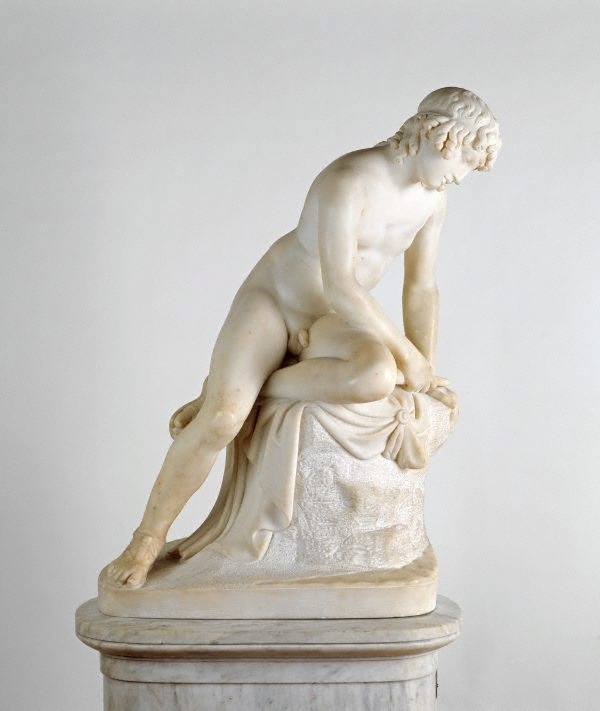 In this version of the Narcissus legend, inspired by a Roman youth gazing into a fountain, the sculptor transformed an everyday sight into a vision of antiquity. The subject's hairstyle and footwear are dutifully quoted from classical sources. Signed front of base [incised into marble], "I. GIBSON...". Not dated. Renée Free, Art Gallery of New South Wales handbook , 'European', pg. 36-56, Sydney, 1988, 39. Ruth Iredale., AGNSW Collections , 'From Monuments to Modernity', Sydney, 1994, 128, 129 (colour illus.). Ruth Iredale., Look , 'From Monuments to Modernity', Heidelberg, Jul 1986. Bruce James, Art Gallery of New South Wales handbook , 'Western Collection: Paintings and Sculpture', pg. 17-77, Sydney, 1999, 34 (colour illus.). John Gibson's Narcissus , Unknown. Dictionary of British Sculptors 1660-1851 , London, 1953, 161 (illus.). Life of John Gibson R.A., Sculptor , London, 1870. The biography of John Gibson, R.A. Sculptor, Rome , London, 1911, 82.